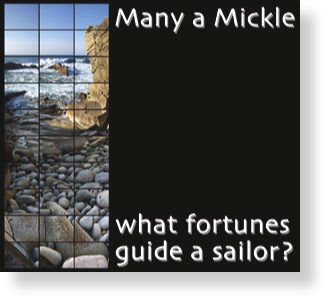 CD - What fortunes guide a sailor? "Their lively and convivial four-part harmony arrangements ... lend a distinctive styling to their performances of a wide selection of material from what might best be described as the English maritime tradition, predominantly sea-songs but with a few shanties and forebitters thrown in for good measure"
"All four participants have strong voices, and Many A Mickle’s combined group sound is also both vibrant and full of life (not for them the laboured renditions of the tired old salts or the overblown gestures of the “tourist fodder” shanty groups). They’re clearly enjoying every moment of their singing together, and feed off each other’s energy." "the two French items, though previously unknown to me, feel authentic and their pace is well-judged, while Adieu Sweet Lovely Nancy, Davy Lowston and Fare Thee Well My Dearest Dear are particularly neatly managed, as is the hoary Sloop John B (which has overstayed its welcome for me over the years but here sounds freshly unearthed). The closing song (the disc’s title track) is also a quite delightful discovery: words by Gina Dunlap and a tune whose contours are rather reminiscent of How Can I Keep From Singing sound together particularly effectively." "The fresh, immediate sound of Many A Mickle’s solidly-conceived harmony work leaves a strong impression, resulting in a most likeable disc that should be appreciated by those who like maritime repertoire yet find the specialist groups a little too austere or male-dominated."